Luke Gall, a 2007 member of the Cadets, submitted this photo and caption. 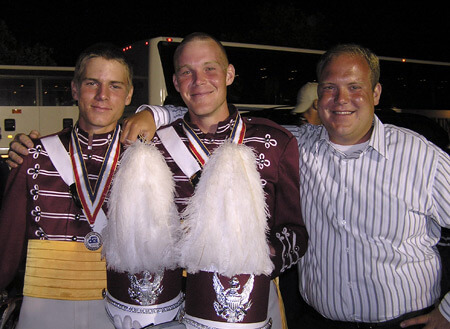 Here's a photo of me and two of my brothers after the DCI World Championship Finals this past year in Pasadena, Calif. All three of us were involved with the Cadets in 2007 either as members or staff. From the left: me (2007 baritone), Jacob (2006-2007 snare), and Josh (2002-2005 tuba, 2007 tuba staff member).